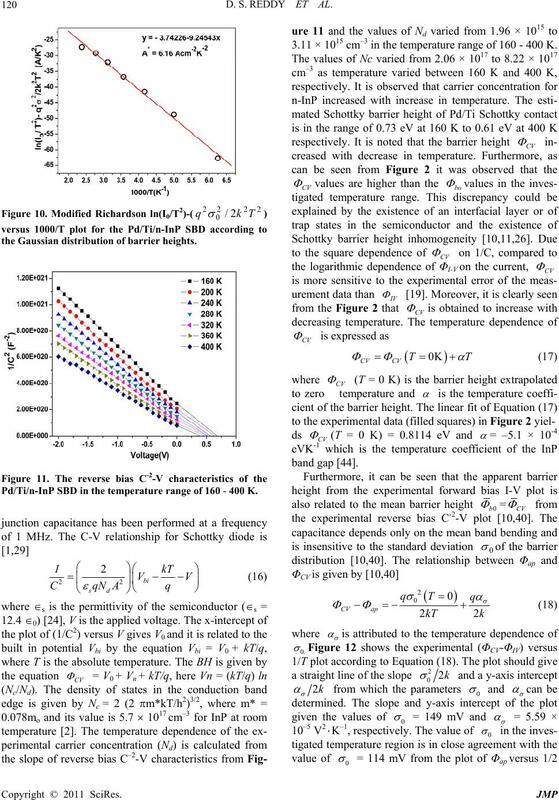 mean barrier height (0b) and Richardson constant (A*) values as 0.796 eV and 6.16 Acm-2K-2 respectively. 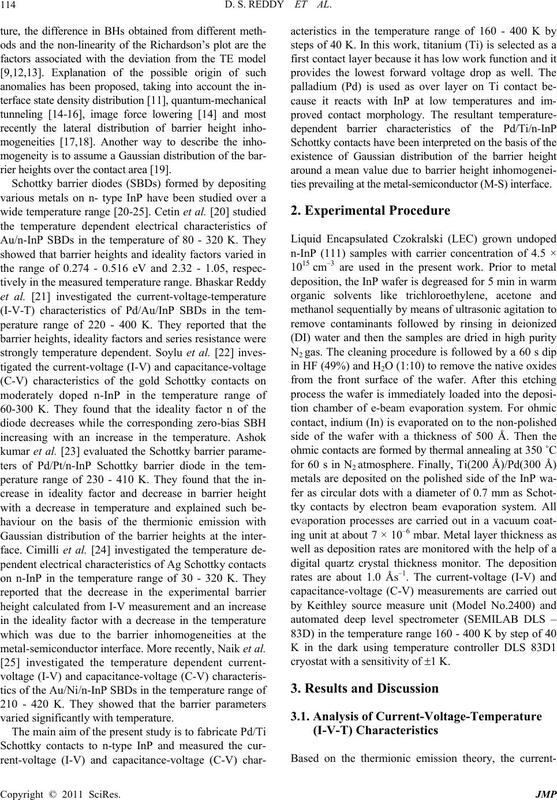 the application of zero-bias Schottky detector diodes . D. S. REDDY ET AL. rier heights over the contact area . metal-semiconductor interface. More recently, Naik et al. ties prevailing at the metal-semiconductor (M-S) interface. 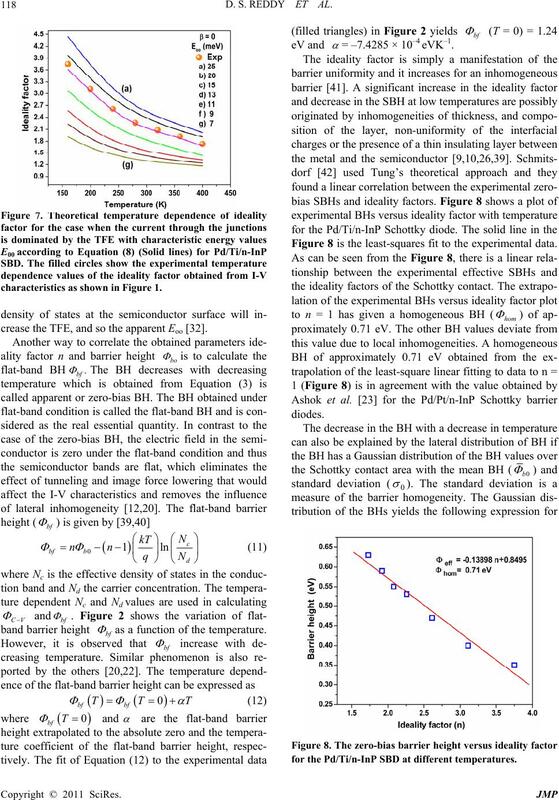 cryostat with a sensitivity of 1 K.
perature range of 160 - 400 K.
sufficient energy to overcome the higher barrier [11,26]. layer between the metal and semiconductor [1,27]. Figure 4. Plot of dV/dln(I) versus I for Pd/Ti/n-InP SBD. 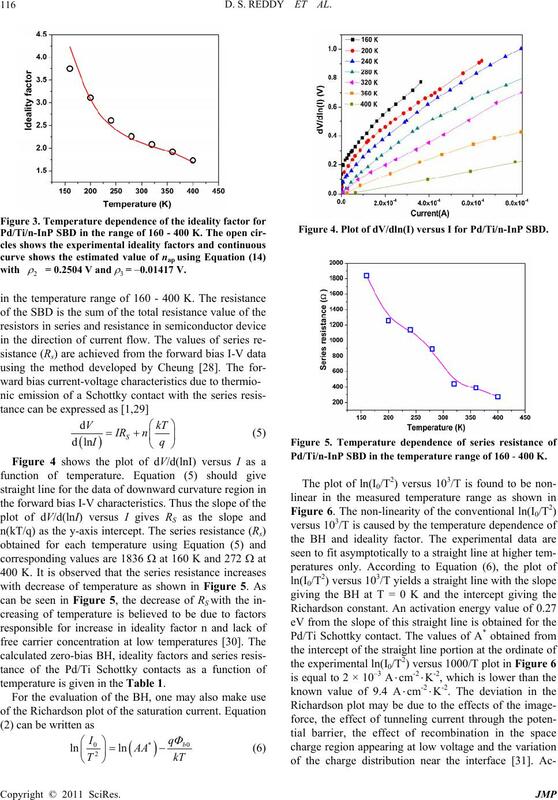 Pd/Ti/n-InP SBD in the temperature range of 160 - 400 K.
temperature is given in the Table 1.
perature range of 160-400 K.
that is different from the calculated one. electric constant and is the electron effective mass. junction is dominated by the TFE is shown in Figure 7.
acteristics as shown in Figure 7 (curve C). characteristics as shown in Figure 1.
crease the TFE, and so the apparent Eoo . 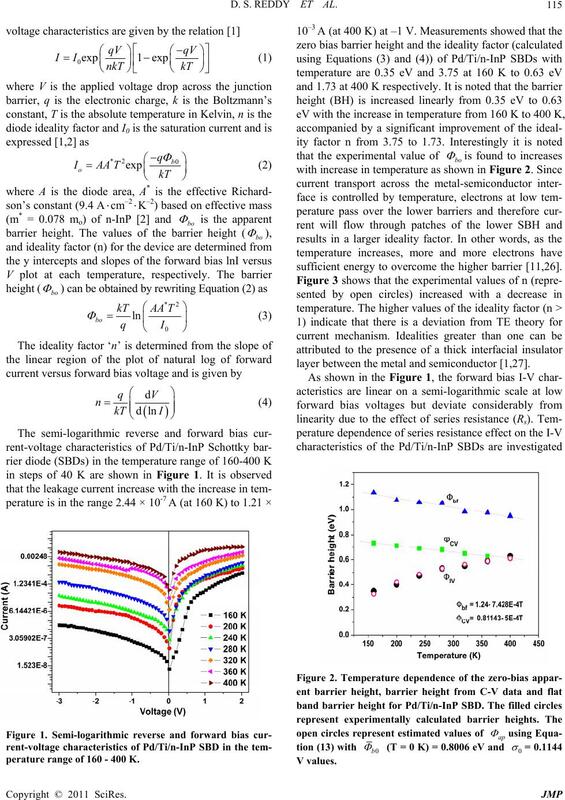 band barrier height bf as a function of the temperature. = –7.4285 × 10–4 eVK–1. Figure 8 is the least-squares fit to the experimental data. for the Pd/Ti/n-InP SBD at different temperatures. 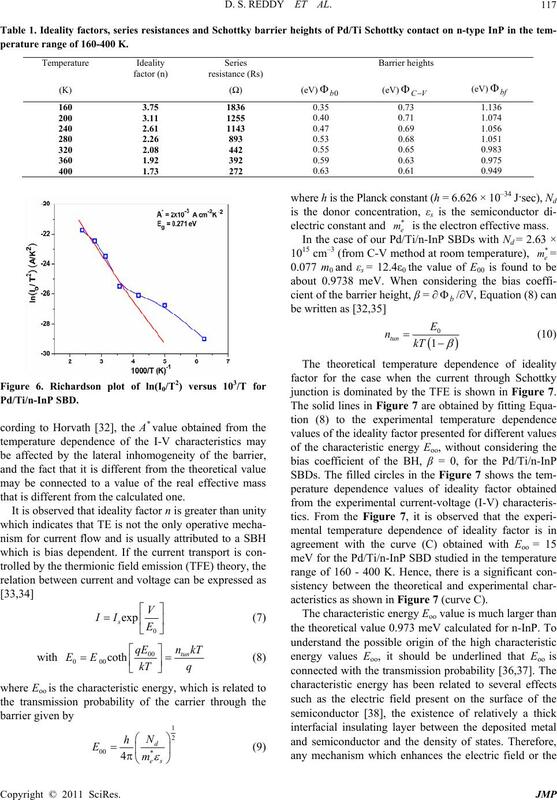 where ap is the apparent BH measured experimentally. the conventional Richardson plot deviates from linearity. the Gaussian distribution of barrier heights. 3.11 × 1015 cm–3 in the temperature range of 160 - 400 K.
as a function of inverse temperature. Richardson plot as shown in Figure 6.
ence of Gaussian distribution of barrier heights. istry of III-V Compound Semiconductor Interfaces,” C.
W. Wilmsen, Ed., Plenum Press, New York, 1985.
cepts,” Materials Science and Engineering: R, Vol. 35, No. 1-3, November 2001, pp. 1-138. Vol. 37, No. 8, August 1994, pp. 1461-1466. 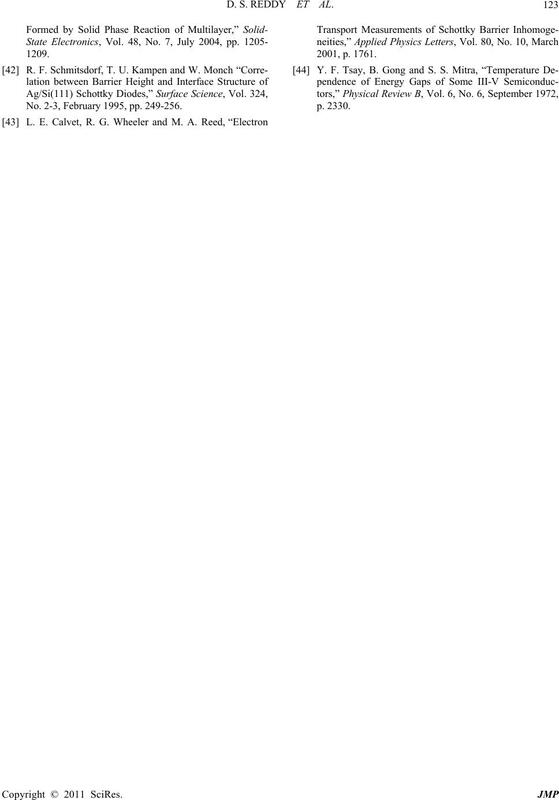 Y. P. Song, R. L. Van Meirhaeghe, W. H. Laflere and F.
ers,” Solid-State Electronics, Vol. 29, No. 6, June 1986, pp. 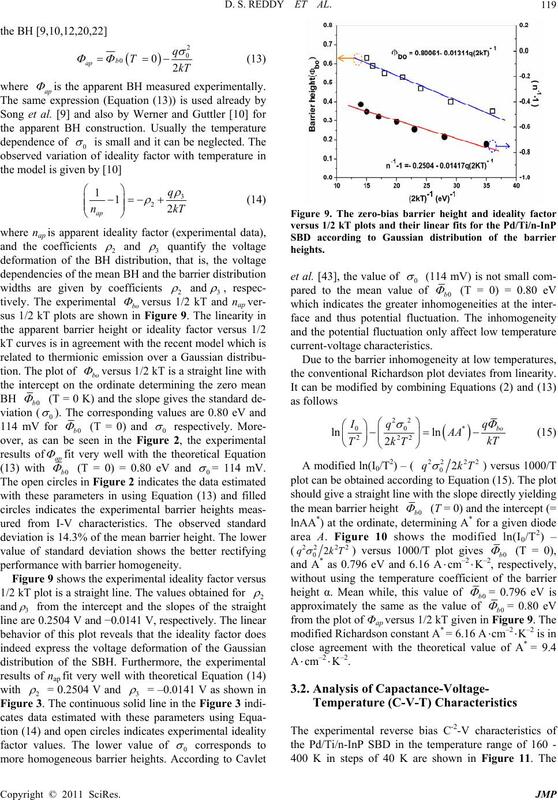 at Schottky Contacts,” Journal of Applied Physics, Vol. 69, No. 3, February 1991, p. 1522. No. 23, June 1992, p. 13509. Vol. 82, No. 24, June 2003, p. 4367. F. A. Padovani, “Semiconductors and Semimetals,” R. K.
Vol. 20, No. 3, March 1977, pp. 171-175. Engineering: B, Vol. 14, No. 3, August 1992, pp. 266-280. 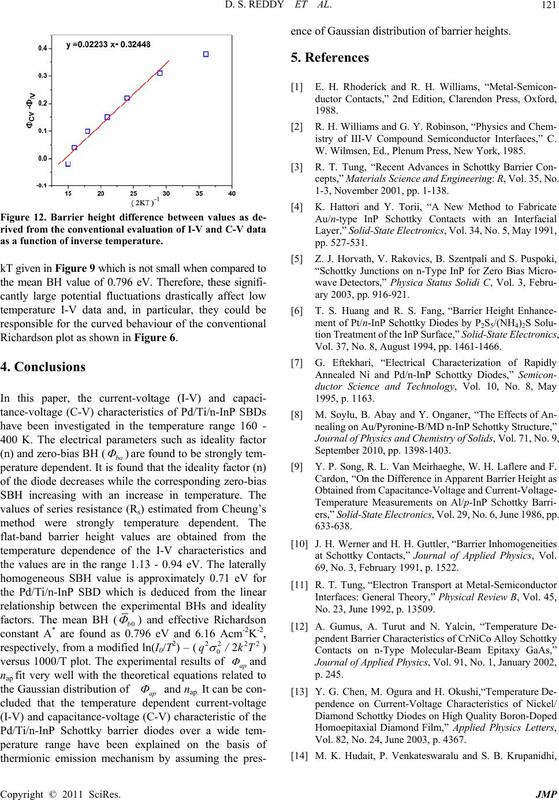 Journal of Vacuum Science & Technology B, Vol. 15, No. 4, July-August 1997, p. 1221. No. 6, May 2005, pp. 625-631. No. 5, September 2009, pp. 972-977. A. Ashok Kumar, V. Janardhanam, V. R. Reddy and P.
structures, Vol. 45, No. 1, January 2009, pp. 22-32.
tronics, Vol. 20, February 2008, pp. 105-112. No. 12, December 1991, p. 7403. Science, Vol. 252, No. 8, February 2006, pp. 2999-3010. Edition, John Wiley and Sons, New York, 1981. N. Newman, M. V. Schilfgaarde, T. Kendelwicz, M. D.
Physical Review B, Vol. 33, No. 2, January 1986, p.
tronics, Vol. 9, No. 7, July 1966, pp. 695-707. 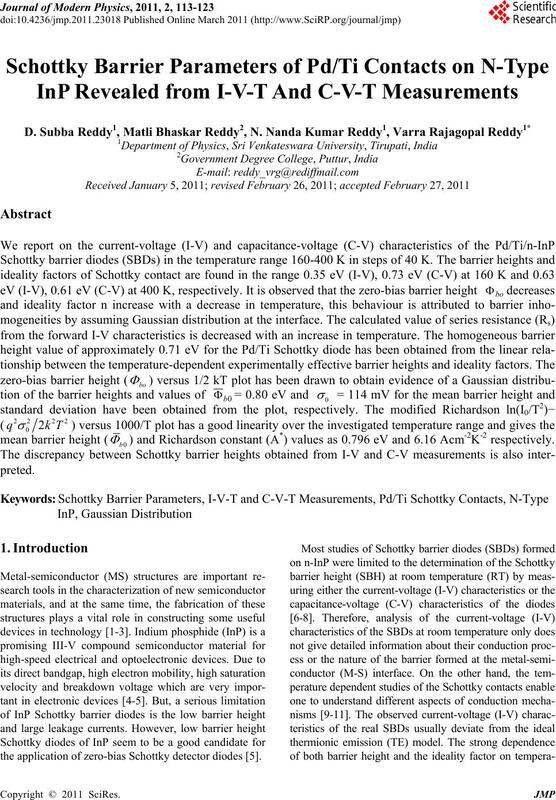 (Schottky) Barriers,” Solid-State Electronics, Vol. 12, No. 2, February 1969, pp. 89-105.
tector Diodes,” Vacuum, Vol. 71, No. 1-2, May 2003, pp. No. 11, December 1999, p. 6431. Solid-State Electronics, Vol. 45, No. 1, January 2001, pp. Applied Physics, Vol. 73, No. 3, February 1993, p. 1315. 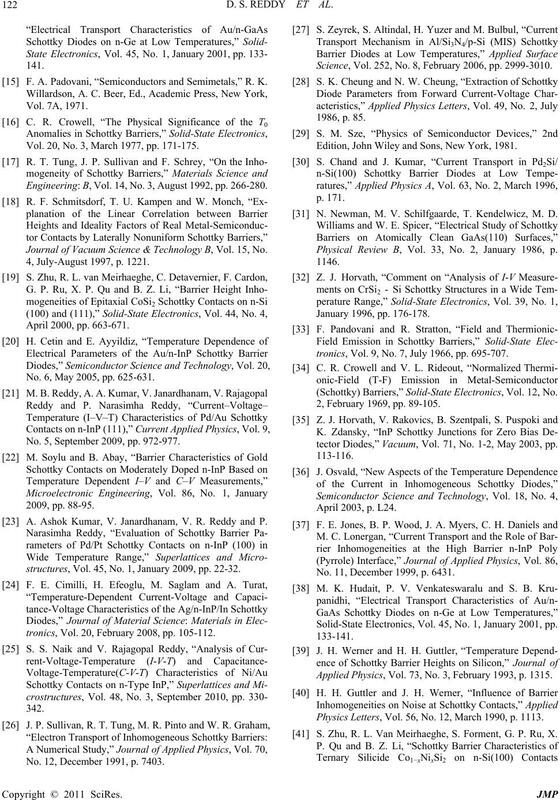 Physics Letters, Vol. 56, No. 12, March 1990, p. 1113. S. Zhu, R. L. Van Meirhaeghe, S. Forment, G. P. Ru, X. No. 2-3, February 1995, pp. 249-256.